March is so boring, and i’ve been doing so well with my shop, so i decided to give back with this awesome march give away! 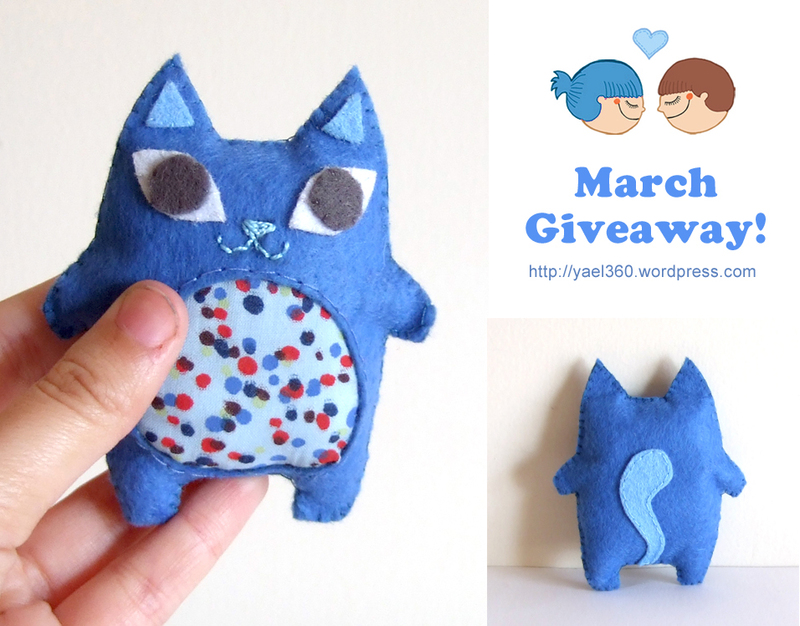 This entry was posted in Uncategorized and tagged blue, cat, crafts, cute, etsy, fabric, felt, free, giveaway, giveaways, international, kitty by yael360. Bookmark the permalink. That blue happy owl is so cute! I would love to have him. I love the Totoro with umbrella pouch; I adore Totoro and the tiny umbrella is so cute. My favorite item from your shop is the Beautiful whimsical woodland creature, deer fawn silver necklace with blue czech crystal because it’s just so elegant and dainty! is my favorite; she has the look on her face that my cat gets; I call it the “who me?” look. I like the noface (Kaonashi) and soot cell phone charm!! I love totoro small pouch! I LOVE Totoro!! I’m so glad that I found your shop. They are all so cute. Heck I love all of your Studio Ghibli items! Especially your Haku pendant! Great likeness!! Your products are soooo cute! I love totoro! I added it to favourited on etsy anyway ❤ You're so good in painting. I think the Green and blue happy owl keychain plushie is soo cute! OMG! SO Kawaii! I would love him! I love the cupcake bag and the pouches! But since I’m a cat lover I would love to welcome this cute cat plushie! Hello and thank you for this possibility! I reblogged your Tumblr post. I am Tirabaralla on Flickr as well. I love the Fat Cat coin purse and all the tote bags! I can’t choose really, they all so cute 🙂 Let my favorite be Blact and White fat cat plushie! Light blue Super cute Rainbow kitty plushie / softie / doll with mushroom fabric is my fave!